Planting a rose in a container is basically like planting any other container plant. Dig a good hole, put in some good organic amendment, fill the hole back in and water well! We want you to always bury the bud union no matter where you live. That’s right, no matter where you live. What is the bud union? It’s the base of the rose plant above the roots where all the canes come from. That is where a piece of the rose you purchased was grafted (or budded) onto the root stock. Burying that bud union protects it from cold temperatures and it also secures the plant more fully into the ground. 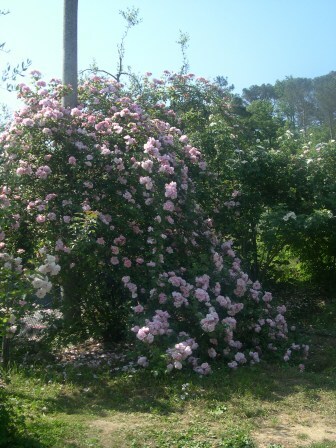 The latter prevents “wind rock’ which is when the rose rocks back and forth in the wind and loosens the soil around it. Or even tips over! Burying the bud union also means the rose will eventually revert back to its own roots and we feel own-root roses make better garden roses. If you amend the entire planting area from the beginning and then regularly you don’t need a large hole. Only one slightly larger than the pot. Use a product containing mycorrhizae that you will add to the hole so it comes in contact with the roots. Backfill with a 50/50 combination of native soil and organic compost. Adjust according to your soil type as needed. Planting a container rose is just like planting any other container plant. For further information see our section on own-root vs grafted roses under Getting Started.